Today I'm not writing this blog post but dictating it to my Ipad as my mum has taken my glasses to the shop (to get them fixed before my holiday) and I'm left blind until she get back at 4 (hopefully) with either my fixed glasses or a new set of contacts for me. I say hopefully because I'm meant to be going out at 4 haha uh oh this could end badly! Earlier today Andrew and I went out into the countryside for lunch at the cutest little cafe! 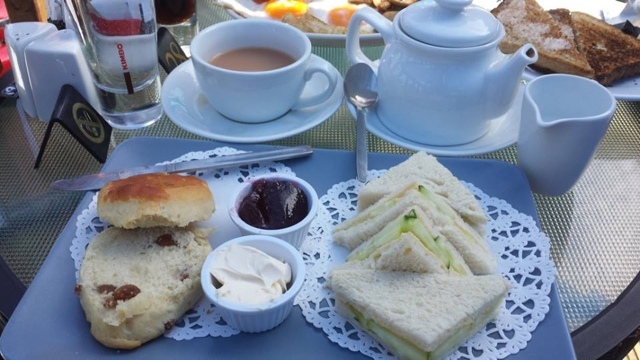 We sat outside on the terrace and ate there, i had a little afternoon tea plate with a cucumber sandwich and a scone and Andrew had a fry up! Afterwards we came back to mine and I've just had my hair cut. For this evening the boys have plans to go to a Bavarian Beer House in London somewhere, so I'll join them on that but there's no way you'll be catching me drinking beer, yucky, especially from those crazy huge man glasses, I'm sure ill get some photos of them though and hopefully find myself a nice cocktail or somthing! Keep a watch on my Twitter or Instagram for updates on that! This is what I wore for lunch and is somthing new for me, a lovely floaty lace dress from Lily.J at Fuse Fashion, a new one for my daytime dress collection which is growing ever so slowly! It was really hard to find any shoes to go with it because I only have black shoes, so I ended up wearing my new leopard print wedge trainers, (which I won from The Platform on Instagram a few weeks ago) which were the perfect colour! yummy scones! i love your shoes too.